If you're considering new siding but want to stay away from Fiber cement siding, there are a few categories of alternatives. Below I'll list the main types of siding you could choose and then give some details of why we have found Everlast to be a better solution than all of them. If you know about fiber cement siding than chances are you also know about vinyl siding and have already ruled it out. If not, here are the top frustrations people have with vinyl siding. Wood siding, usually cedar, is still installed in many regions across the United States. Although beautiful at first, wood lap siding and shingles have problems of their own. There's a third class of siding--wood based composites, or "engineered siding". These products are similar to fiber cement, but without the cement. THey're comprised of mostly sawdust, or wood chips and some type of resin or glue. They tend to be cheaper than real wood siding but have many of the same issues. Why is Everlast a Better Solution? Unlike fiber cement which is just painted cement and sawdust, Everlast™ is colored through and won't need painting unless you desire to change the color! Fiber Cement and other wood based siding absorbs water which leads to rot and peeling paint. Everlast™, made from over 60% stone, has no wood fibers and won't rot--Guaranteed! 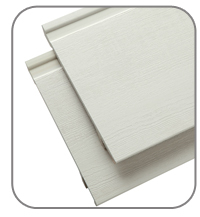 Everlast™ is 543% thicker than vinyl siding which is flimsy, brittle, and cracks easily. Everlast's™ thick planks give it the appearance of real wood clapboard. Wood siding can be very beautiful to the eye, and it is durable. It takes a variety of finishes well and may come.. Homeowners who are looking for durable and cost-effective siding options often turn to one of two options: Cedar..